General Purpose, Disposable Masks - General purpose, disposable masks for low-risk dust and water-based airborne sprays. High Vibration Risk Equipment - The red glove symbol covers products over 10m/s2. This equipment could cause vibration injury even when used for a short time each day. Specific assessment will be required. Contact Health & Safety Helpdesk for further guidance. Installing pipework, ducting or vents through masonry walls? 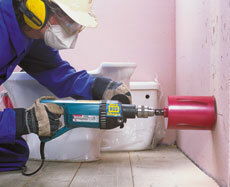 This hand held diamond core drill can bore up to 152mm cores quickly and accurately. Power breaker RCD plug and extension cable drum can be hired online and safety equipment can be purchased online or from HSS shop when you collect. Note: There is a minimum Diamond wear cost of £7.50 + vat if in doubt please speak to your local branch.